﻿ Book Caribe Town (Puerto Viejo de Talamanca) - 2019 PRICES FROM A$140! Located 492 feet from Playa Cocles Beach, Caribe Town offers tropical gardens and a saltwater pool with a swim-up bar. Puerto Viejo town is just 1.9 mi away. The Caribe Town is a gated property which features suites, bungalows and houses, all decorated in a charming rustic style. All accommodations has a terrace with hammocks, free Wi-Fi and a private bathroom. 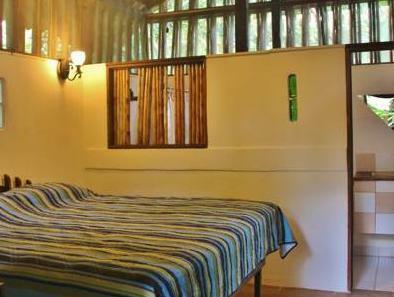 The houses also have their own fully equipped kitchens, while suites and bungalows have access to a shared kitchenette. Grocery stores and restaurants can be found within 0.6 mi. Caribe Town offers free secure parking on site. A popular surfing beach is just 0.6 mi away, while Manzanillo Gandoca National Park is 6.2 mi away. Juan Santamaría International Airport can be reached in a 4-hour drive, and Caribe Town can assist guests in arrange transportation.